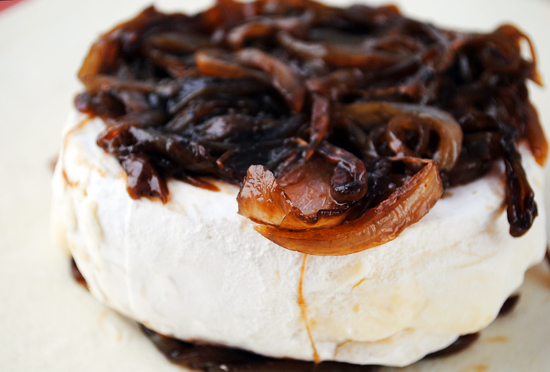 Caramelized balsamic onions coax the mild brie to create a rich and sumptuous appetizer that will tease your taste buds. 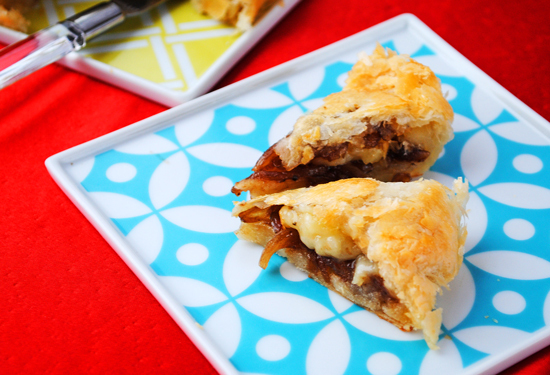 I really enjoy the flavor combination of the balsamic with the caramelized onions– it adds the perfect amount of tartness to the sweet onions, which, helps cut through the richness of this appetizer. Dieters need not read further. 1. 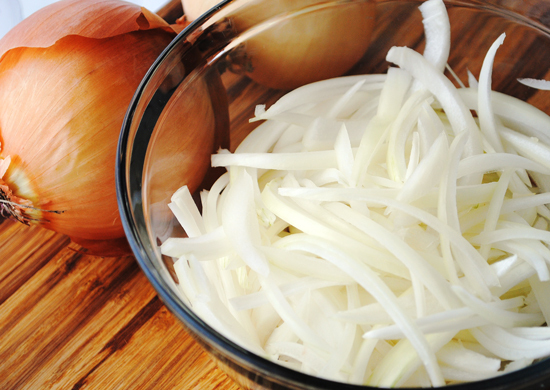 Cut onion into medium-size slivers. 2. 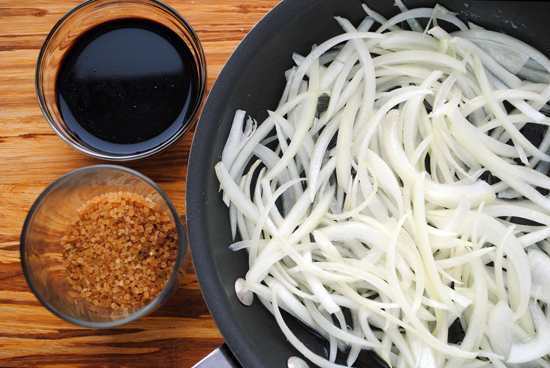 In a skillet, over medium-low heat, sauté onions, oil, salt, balsamic vinegar, and sugar. 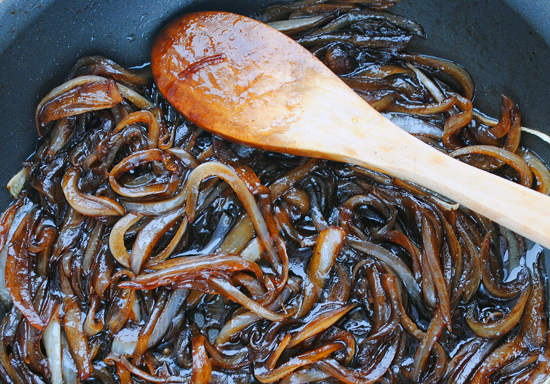 This step takes about 20 minutes from start to finish: you don’t want to raise the temperature higher because you might risk burning the onions before they soften and caramelize. Most of the balsamic vinegar should evaporate during the cooking process. You can always caramelize your onions a day or two in advance, and refrigerate them in an airtight container for when you are ready to finish the steps. 3. Drain any liquid from the onions in a sieve. 4. Pre-heat oven to 375′F. 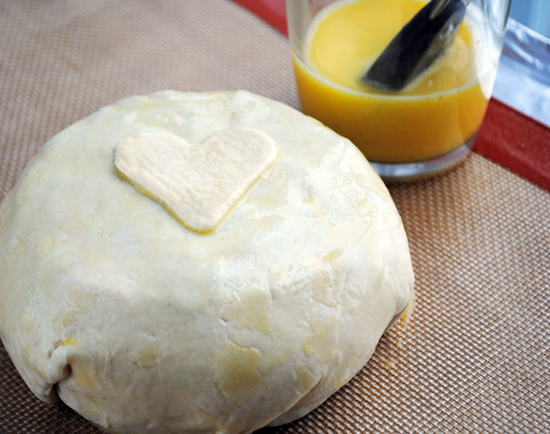 Evenly roll out puff pastry dough to 1/8″ thin, or until it is ~ twice the size of the diameter of your Brie wheel. 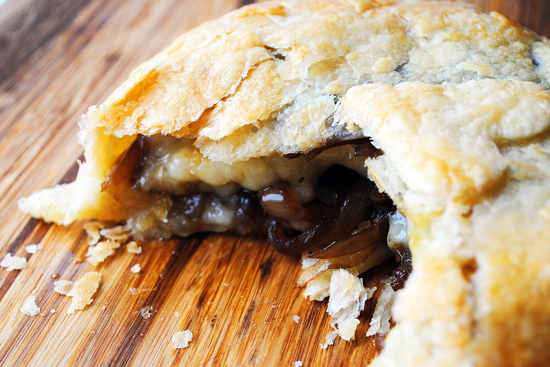 Place a small amount of the caramelized onions in the centre of the puff pastry, place the Brie wheel on top, and cover with the remaining caramelized onions. 5. Carefully grab the edge of your puff pastry, and stretch it towards the center. 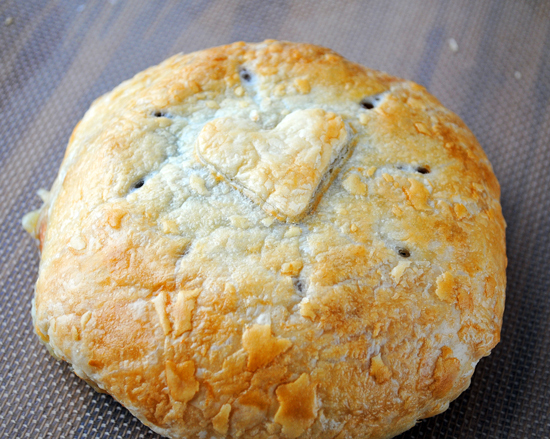 Continue to pull in the edges of the puff pastry towards the centre, sealing the wheel securely in the centre. Flip the puff pastry over so that the seam is on the bottom. 6. In a small bowl or cup, make an egg wash by whisking the water and egg together. 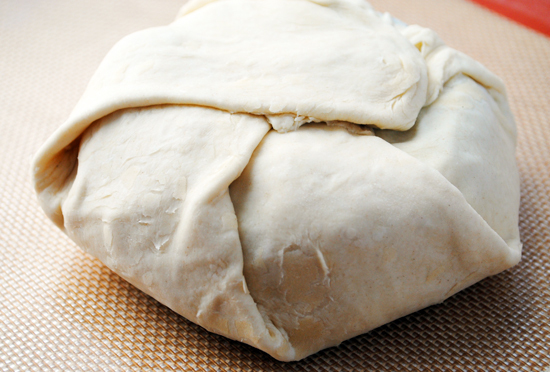 Brush the puff pastry with the egg wash, being careful not to over-soak the dough– a light brush is sufficient. Place on baking sheet and bake for 15-20 minutes, or until golden brown. Remove from the oven, and allow to sit on the baking sheet for 5 minutes, before transferring to a serving dish. 7. Enjoy it. Dare you to not have more than one slice. - My cheese oozed out of the puff pastry: Likely, your puff pastry was rolled unevenly, too thin, or might of had a hole in it. While the puff pastry should be thin, it should also be rolled out evenly to prevent leaks. - My dough was soggy: Likely, your oven was too hot, and the puff pastry didn’t have a chance to cook fully. Wonderful mix of flavors and it’s just so pretty! Oh, this is fabulous. Pretty and delicious – how could you go wrong? I think this is something to really impress your guests! I love the ingredients here…looks pretty and I’m sure it tastes delicious! I made this for a small dinner party on Saturday and it was a huge hit! I used Camembert because I couldn’t find a big enough Brie. It was gone in seconds!! Thanks for the recipe! briarrose — I was a little skeptical of the balsamic at first, but once the tang/bitter cooks out, it sweetens the onions that much more. Melissa — If you can believe it, the pictures hardly do it justice! Could this be made without the puff pastry? 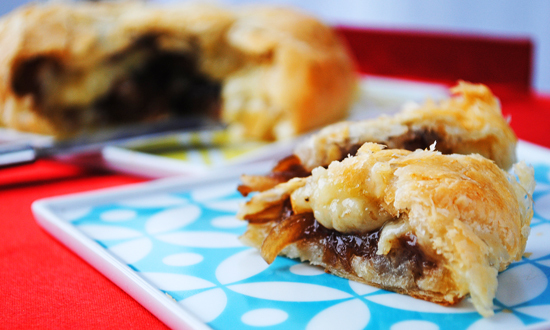 Would like to top brie with the caramelized onion recipe and serve with crackers or baguette chips.